Major spoilers for Bodyguard Season 1 to follow. 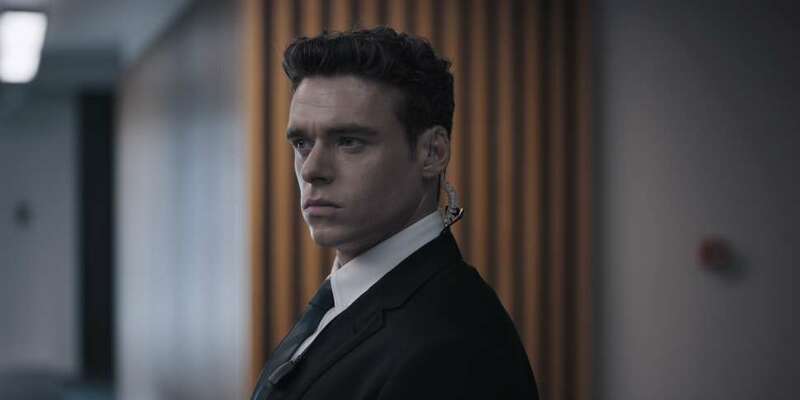 Netflix's latest thriller binge is a British import that won't let you down: Bodyguard, a miniseries that spans six episodes of high-stakes political intrigue. The show stars Richard Madden (of Game of Thrones fame) and Keeley Hawes (from Starz's The Missing), and is so suspenseful you’ll be out of fingernails by the end. We can't recommend it enough. New fans have Jed Mercurio, the mind behind the BBC's popular Line of Duty, to thank. The showrunner worked closely with real police protection officers and explosives experts to craft the story of David Budd (Madden), the titular bodyguard who's charged with protecting the UK Home Secretary (Hawes) amid a string of terrorist attacks. David's straightforward job becomes more than a little complicated once personal and professional boundaries blur, and, like we said, the result will leave you feeling very stressed. In a good way. If you haven't already, finish season 1. Then read on. We called Mercurio to discuss his new show's most stressful moments, the reason for that heartbreaking death, and what a second season could look like. Thrillist: This finale is one of the most intense episodes of TV I've watched in recent memory. What strategies did you employ to make the bomb-defusing scene, in particular, feel so fresh and suspenseful? Jed Mercurio: To make the bomb-defusing quite quick and simple in a lot of ways just diminished the threat. So it was important that the character [David] was in a situation that appeared to be of great jeopardy and complex jeopardy. We needed a certain number of fail-safes in the device in order that he wouldn’t be able to get out of it, because normally a person who’s wearing one of those things is compliant with the mission. So, the idea that somebody is put in one of those things, and any attempt to rebel against the mission would lead to it going off, was crucial. In terms of the defusing of the device, we got advice from explosives experts about strategies and procedures that would be applied to the real version of this situation. [The suspense] was much more about the story that’s going on parallel: What secrets David’s revealing in that scene, how he tries to manipulate the situation, and how people are responding to him with skepticism -- that people wouldn't believe certain things he said and then they would believe other things he said. A lot of work went into making it credible. What becomes so exciting is watching David work his way out of that predicament. How did you come up with his escape plan? Mercurio: We felt that the character had to be part of the final denouement. So he had to be in a situation where he didn’t trust that he was still going to be listened to. That meant creating a kind of dramatic arc where even if he succeeded in defusing the bomb and gave himself up, all that would happen would be he’d be taken into questioning and the bad guys would still be at large. At that point in the story, he’s very skeptical that the authorities will follow through with the investigation. So he actually does a number of things, early on, to lay the groundwork for his escape: He tells his wife to leave, he makes sure everyone is as far back as possible, he asks questions about the progress of the investigation. All those things lead into his escape, but he didn’t communicate any of that to the audience or to those other characters, so it’s a big surprise when he continues his mission. That whole sequence is pretty long and demanding of the viewer -- how was it on set, especially for Richard Madden? Mercurio: He was always very well prepared and hard-working. I think [the whole bomb-defusing moment] was probably the biggest challenge for him, just because of how long the sequences were and the number of days of filming. As it happened, weather conditions were also pretty tough. It was very cold when we were filming. That, I think, added something to it. It made it more uncomfortable to be there on set, for so long, and it was multiple days. But I think that discomfort was possibly quite useful for everybody, in terms of adding to the tension. Some critics have called the relationship between Julia and her bodyguard unrealistic -- why was it important to create a romantic subplot between them? And why kill her? Mercurio: The relationship between David and Julia, we felt, really worked for the thriller because both characters are kind of not what they seem to each other. So, the audience is in on the fact that David may be part of a conspiracy to do harm to Julia, and we know that Julia is conducting some kind of conspiracy with the intelligence community to enhance their powers. There’s an advantage to both of them in convincing the other to trust them implicitly. So, there’s an advantage to David making her put her guard down and possibly allowing him to lead her into jeopardy. And from her viewpoint, in terms of the improper procedures she’s following -- the lack of oversight over her political machinations -- she needs her protection officer on board so that he won't be reporting to the authorities that she’s doing something she shouldn’t be doing. So it felt that it did function very well for the thriller, and then her death gave more impetus to the second half of the series. Because as it turns out, David did have an emotional investment in their relationship, so he’s highly motivated to solve her murder. How was the off-screen stress of the show compared to the on-screen stress? Mercurio: There’s a kind of tension that goes along with any kind of [scene], actually, because a lot of preparation goes into it, and then what happens is you need everything to work on the day. And that isn’t always the case. The most stressful moment we experienced was in relation to the opening sequence, on the train. That had originally been conceived to be shot in a rail station -- built around a static train, waiting to leave the station. But we lost permission to shoot there, so we had to completely reconceive that sequence. Fortunately, we found out we were able to facilitate the production on a private railway line, but that meant the whole opening sequence had to be rewritten to a moving train. Were there any other big moments that had to be tweaked or cut? Mercurio: Mostly, we tightened up things. The intricacies of the action weren’t quite in real time. We [wrote] them in a way that they appeared to be in real time, but actually they're not. It was more of a refinement process than big things. I suppose there was some dialogue cut, like after that bomb-defusing sequence -- in terms of the final denouement of the characters that were part of the conspiracy being revealed. There was more explanation of exactly how certain people got involved in the conspiracy and the steps in that conspiracy. Some of those things we removed because we felt they were unnecessary details. The ending feels a little wrapped up for David, but less so for the others. Why did you decide to end it the way you did, and what does the ending mean for the characters going forward? Mercurio: We wanted to create a balance at the end so it wasn’t like every single character got their comeuppance. There was some kind of trade-off between the establishment being protected and certain individuals being sacrificed. We wanted to show something where there was a sense of scapegoating certain individuals to protect people who, maybe in the end, would ultimately make the bigger power grabs. And also just in terms of the police characters around David, we were playing a game that some of them maybe were involved in the conspiracy and some of them maybe weren't. So when it was revealed that many of them weren’t, they would kind of just continue in their jobs unhindered. Was that truth about the conspiracy something you had planned all along, or did it evolve during the writing process? Mercurio: It was a combination of the two. As the conspiracy, and the kinds of information that needed to be disclosed to the bad guys, got better defined, it became more obvious who would have access to that kind of information. We wanted [the twist] to be plausible, and also, I suppose the big decision we made was that there wasn’t one person who was doing all the plotting and the carrying out of the terror events. It was a combination of characters who we never saw together, so we kind of always kept them apart so there was never a sense of complicity between them. What would season 2 of this show look like? Mercurio: If we're lucky enough to do a second season, we would try to kick off with a whole brand-new threat. It’s great that we have a few characters who are still available to us. We’ve obviously got some of the political and police characters still available to us, but in terms of what a second season would be about, I definitely don’t think it would be a follow-up to what season 1 was. It would introduce new characters and new threats. You're working on Line of Duty right now. How's production going, and can you tease what to expect for season 5? Mercurio: Yeah, we're kind of halfway through the shoot. It'll be around next year, and it's going really well. There's not much we've released yet about the show, apart from the guest lead being Stephen Graham, and he's playing a criminal who is part of the ongoing anti-corruption investigation into the relationship between organized crime and corrupt police officers. Sean Fitz-Gerald is a former Thrillist Entertainment staff writer pursuing his writing dreams in Los Angeles.